The president says Carney is a close friend upon whom he will rely for outside advice. 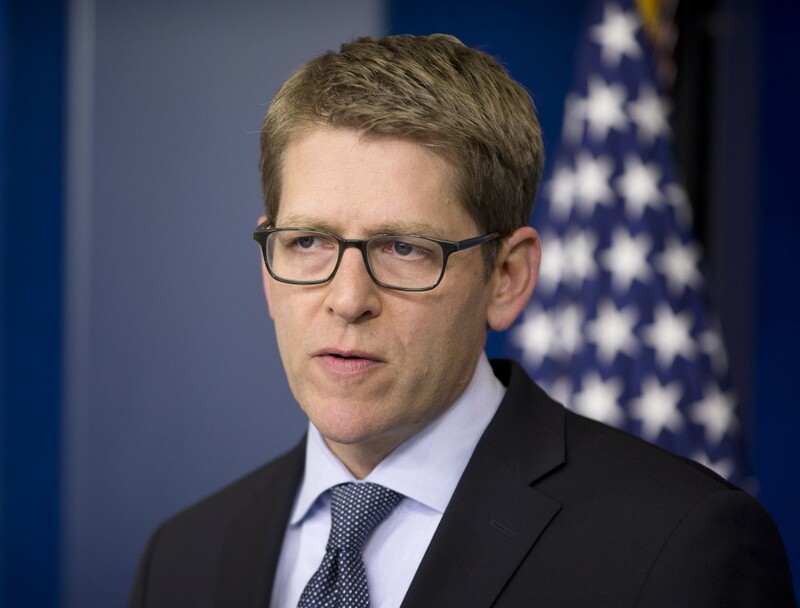 WASHINGTON – White House press secretary Jay Carney became the news instead of just delivering it Friday, when President Barack Obama unexpectedly interrupted the daily media briefing to announce Carney’s resignation after three and a half years as his primary spokesman. Obama said it was “bittersweet” to see his friend Carney step down and announced that principal deputy press secretary Josh Earnest will take over the job. Carney said the transition will take place around mid-June, but Earnest will take his place traveling next week on Obama’s trip to Europe. White House Press Secretary Jay Carney listens during his daily news briefing at the White House in Washington on May 19, 2014. Carney is leaving his post and his No. 2 is taking over. President Barack Obama said principal deputy press secretary Josh Earnest will take over the job. 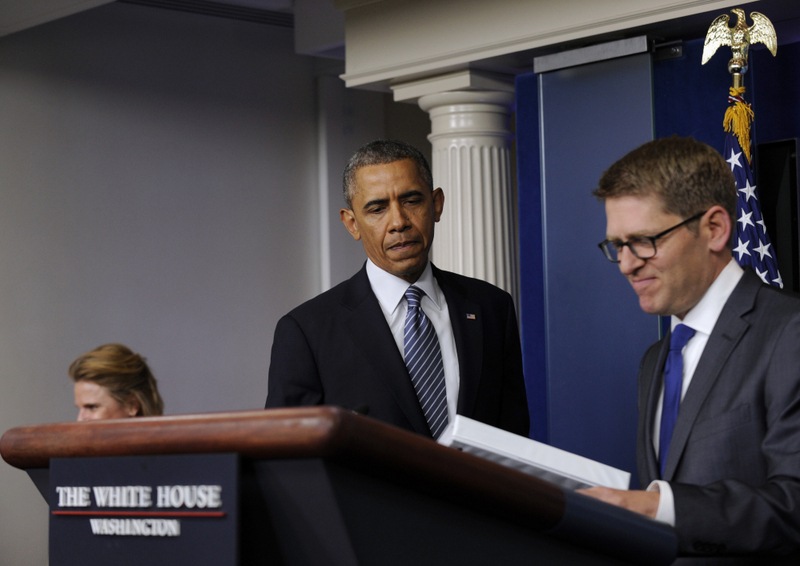 White House press secretary Jay Carney closes his briefing book as President Barack Obama makes a surprise appearance to the Brady Press Briefing Room of the White House in Washington on Friday to announce that Carney will be stepping down in June. Carney brought rare but practical experience to the job as a former reporter who once covered the White House for Time magazine. He left journalism to become communications director for Vice President Joe Biden and subsequently moved over to serve as Obama’s press secretary in 2011. A key component of a White House press secretary’s job is to regularly joust with reporters in an intense question-and-answer session. Obama said he is putting the “flak jacket” for dealing with the press on another friend in Earnest, who has worked with Obama since he was his communications director for the Iowa caucuses in the 2008 campaign. The affable Earnest is well-liked within the White House press corps, and is seen as helpful. Reporters applauded the announcement. Earnest is a native of Kansas City, Missouri, and Obama noted he still roots for the hometown baseball team, the Royals, as the son of an athletic coach. Earnest, 39, regularly conducts the briefing at the White House or aboard Air Force One when Carney is absent. He has been deeply involved in negotiations with the press corps over access to the president. It was Obama’s second appearance in the briefing room Friday to announce a resignation, the first being under much more somber circumstances as Veterans Affairs Secretary Eric Shinseki left under pressure due to widespread problems plaguing the agency’s health care system. Obama said Carney’s job has put a strain on his family and the press secretary told him in April that he’s been wrestling with the decision whether to leave for some time. Carney said he’s made no decision yet on his next step but plans to take the summer off before starting a new job. He ruled out rumors that he would serve as ambassador to Russia, after having covered the collapse of the Soviet Empire for Time. He said his wife, ABC News correspondent Claire Shipman, and two children wouldn’t welcome such a move. Carney, who celebrated his 49th birthday last week, expressed his appreciation for working at the White House for more than five years, even though he says being press secretary is not easy. Obama said that Carney had demonstrated good judgment and temperament and said he will continue to rely on his advice from outside the West Wing. The two men embraced before Obama made his exit.